Stunning renovated Gulf front end unit conveniently located on the ground floor with direct walkout access to the beach! Unit 116 is an end unit for added privacy. This ground floor 2-bedroom, 2-bath condo is the perfect beach getaway and is the largest 2BR floor plan totaling 1,510 square feet. Custom hallway bunks & built-in shelving have been added to maximize the rentals and is a great bonus for guests! Interior is professionally furnished & decorated by Lovelace Interiors with a soft coastal feel sure to put you at ease! Updated 20'' tile floors extend throughout the main living & dining areas, entry and kitchen for easy maintenance at the beach. This is an ideal open floor plan with trayed ceilings, recessed lighting & a great kitchen with breakfast bar and ample cabinets. 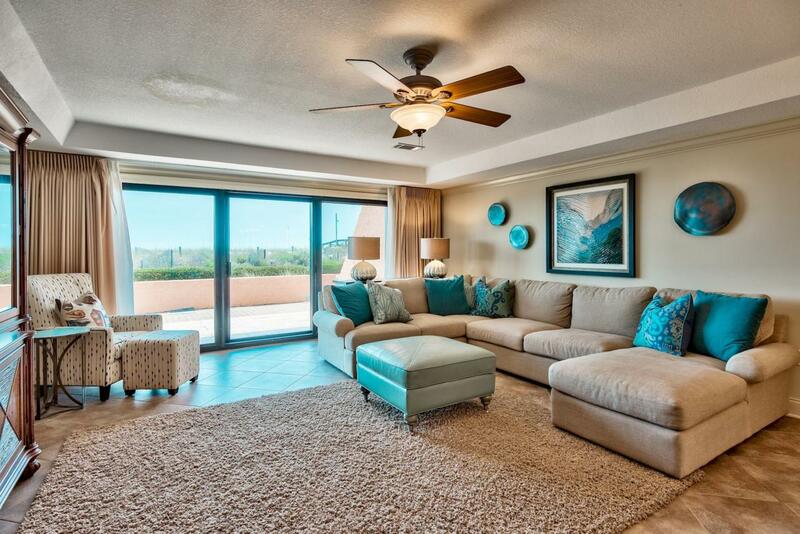 New AC!The living area is very spacious and welcoming with a huge sectional sofa with pops of teal reminiscent of the Gulf of Mexico, an additional chair and a large flat screen TV. Large glass sliders bring in great natural light and extend across the living area and master bedroom with direct access to an oversized patio. The kitchen has been beautifully updated with plentiful hardwood cabinets, granite countertops & breakfast bar and tile floors. There is an additional dining area for six and the breakfast bar is great for casual dining. The master bedroom is also Gulf front and has direct access to the huge covered patio, perfect for entertaining, relaxing, or just taking in the views. The master offers a king bed and there is an en-suite master bathroom with tile floors. The guest bedroom is large enough to fit two beds and also has an on-suite bathroom. There is an owner's closet in this unit and all the appliances convey, including the washer & dryer. The AC was replaced in 2017! This unit is currently a non-rental unit but has great rental potential. Aegean is a low-density resort ideally located on the popular Holiday Isle Community in Destin. The complex is comprised of 5 buildings, two of which are Gulf front. Unit is located in the East Gulf front building, making this a very desirable location within the complex. Amenities at the Aegean include over 500 feet of Gulf frontage, a lush pool area, BBQ/picnic gazebo, courtyard, shuffle board, beautiful landscaping (maintained by the HOA), and two tennis courts for sports enthusiasts. The complex is close to restaurants, entertainment, and shopping within Holiday Isle and Destin! Do not miss out on this incredible opportunity.